Starring Anna Paquin, Holliday Grainger, Gregor Selkirk, Emun Elliott, Lauren Lyle, Kate Dickie, Steven Robertson, Rebecca Hanssen, Scott Andrew, Lauren Annie Boyle, Ben Bradley, Joanne Gallagher, Zara Howell, Leo Hoyte-Egan, Isaac Jenkins, Sarah McCardie and Alexa Snell. Screenplay by Henrietta Ashworth and Jessica Ashworth. Distributed by Good Deed Entertainment. 106 minutes. Not Rated. Screened at the 2019 Women’s Film Festival in Philadelphia. Is the storyline worthy of this hushed sense of awe and extreme seriousness? Periodically. It has some very arresting plot developments and is rather intriguing in parts, particularly in the last half hour or so. Unfortunately, it also has points that are a bit overwrought and sometimes border on dull. And the chief symbolic conceit – the apparently magic bees of the title – may have worked in the novel, feels a bit awkward and unconvincing on screen. The scarlet L that the film wears is not just for “literature,” though. It also stands for “lesbianism” – specifically a somewhat tragic relationship between a female doctor (Anna Paquin) and a young recently-separated mother (Holliday Grainger) in small town Scotland in 1952. Doctor Jean has just returned to town after having been driven away years earlier due to her sexuality. She has decided to take over her recently deceased father’s practice (and his lovely manor home), leaving behind her sexuality and hoping no one really remembers why she left in the first place, years earlier. Therefore, she dedicates her time to serving the villagers, and she also spends lots of time keeping bees on her manor. It is the bees that fascinate a young boy named Charlie (Gregor Selkirk), He is fascinated by their hive mentality, their ability to promote life, create honey, pollinate flowers. He talks Dr. Jean into letting him study the hives and create a relationship with the small creatures. Through Charlie, Dr. Jean meets his mother Lydia, who was recently dumped by her abusive ex Robert (Emun Elliott) and is now drifting through nights of too much alcohol and bad dates. Jean and Lydia become friends, and when Lydia and Charlie are evicted from their apartment, Dr. Jean generously asks them to stay at her large manor. Jean obviously is attracted to Lydia, but she is trying hard to not allow herself to act on it. Lydia picks up on the vibe and realizes she is kind of intrigued by the kind doctor’s interest. One night they end up in bed together. They are very discrete, and things go well for a short time, but quickly the town learns of their relationship and everything goes to hell. Jean has to try to save her practice – if it is even worth saving. Lydia learns Robert is planning on taking Charlie away from her. Okay, first things first. Yes, I get that Scotland in 1952 was a very bad place and time to be a lesbian. There are not many good options for someone who is stuck in this situation. Still, sometimes, just sometimes, you wish that Tell it To the Bees would lighten up some. There must have been some sunshine in their lives – they had found love, they also love their son, Dr. Jean had a respected practice up until word got out. The film didn’t have to be that bleak through the running time, that self-consciously arty and depressive. Intriguingly, though, when all hell breaks out in the later scenes, that is when the film becomes the most interesting, despite the many dramatic hardships and sometimes over-the-top hard times visited on the lovers and some of the other townspeople. It sometimes borders on melodramatic, and yet for the first time the film feels fully alive and passionate, even if it is sometimes in negative ways. And then there are those bees, which somehow seem to know how to swarm directly to where evil is being perpetrated, leave the good people alone and only attack the bad ones. 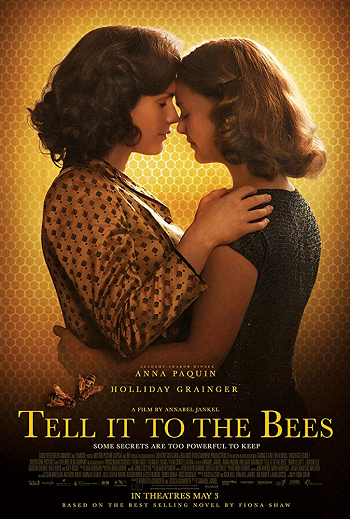 Oddly, Tell it To the Bees sometimes feels like an episode of Masterpiece Theater which has been filmed as a Lifetime tele-movie. Positive aspects of the film – like fine acting by the leads (particularly Grainger and young Selkirk), gorgeous scenery and some fine writing – can be overwhelmed by the extreme gravity and constant misery which seems to suffuse the small town. Copyright ©2019 PopEntertainment.com. All rights reserved. Posted: March 24, 2019. Tags: 2019 Women’s Film Festival, Alexa Snell, Anna Paquin, Annabel Jankel, Ben Bradley, Emun Elliott, Fiona Shaw, Gregor Selkirk, Henrietta Ashworth, Holliday Grainger, Isaac Jenkins, jay s jacobs, Jessica Ashworth, Joanne Gallagher, Kate Dickie, Lauren Annie Boyle, Lauren Lyle, Leo Hoyte-Egan, lesbianism, literary, movie review, philadelphia, Rebecca Hanssen, Sarah McCardie, scotland, Scott Andrew, Selkirk Gregor, Steven Robertson, Tell it To the Bees, Women's Film Festival, Zara Howell. Bookmark the permalink.